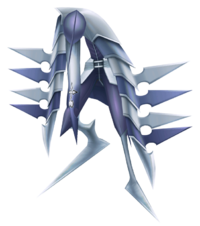 The Assassin is a high-ranking Nobody controlled by Axel that is found in Kingdom Hearts II. An Assassin has a vaguely humanoid body that is covered in a purple and silver bodysuit. Its segmented arms are each lined by four blades resembling spikes on the Nobody logo. Both the blades and segments they are on alternate from silver to purple. It occasionally uses its arms as "wings" to glide through the air. On its head is a small cap strapped by bandages with a long cloth hanging down in front of its face, which is mostly silver with a purple tip emblazoned with a small, white Nobody symbol. Assassins possess the same flexibility as all Nobodies, and occasionally compact their bodies into floating disks reminiscent of Axel's chakrams. The Assassin's name is based on the eponymous job class from Final Fantasy. Assassins spend a lot of time in the ground, during which they are invulnerable to attack. They are only vulnerable when parried. When they attack by flailing wildly, use Guard, then Counterguard and attack. Alternatively, Reflect is also effective. Be sure to use the Reaction Command Fail-Safe, if it appears. This will make the Assassin explode, causing damage to other enemies, except Sora and his party members, and still giving Experience. The upper area of the Hall Of Empty Melodies in the Castle That Never Was has powerful Assassins. However, in Kingdom Hearts II Final Mix, even more powerful Assassins can be fought in the Cavern of Remembrance.